Ricardo Rodriguez, Democratic candidate for Hidalgo County District Attorney, right, talks with Norma Cantu, left, and Velma Ibarra at a polling location Tuesday, March 6, 2018, at Lark Community Center in McAllen. Hidalgo County voters overwhelmingly re-elected Ricardo Rodriguez to a second term as district attorney. Rodriguez received nearly 80 percent of the vote — 35,481 votes to Rene Guerra’s 9,717. “I’m happy and relieved and I’m thankful to the citizens of this county for believing, and more importantly for trusting me with this position for another term,” said Rodriguez, who had already unseated Guerra’s 32-year run in 2014. That election was dominated by the Irene Garza cold case, which four years later is no longer cold as Garza’s killer is now behind bars. A Hidalgo County jury convicted ex-priest John Feit of Garza’s 1960 murder in December, a conviction considered a victory for both Garza’s family and Rodriguez, who in 2014 campaigned in part on a pledge to reopen the case. Yet this season, the Garza case took a backseat to other issues, namely services for crime victims and politically motivated decisions. Guerra accused his opponent of allowing the DA’s office to be “bought,” questioning why a defendant arrested on a murder charge was sentenced to four years in prison in 2015 on a lower-level manslaughter charge as part of a plea deal approved by Rodriguez. Guerra characterized the deal as a favor to the defense attorney who in exchange had donated to his campaign, an allegation Rodriguez denied. 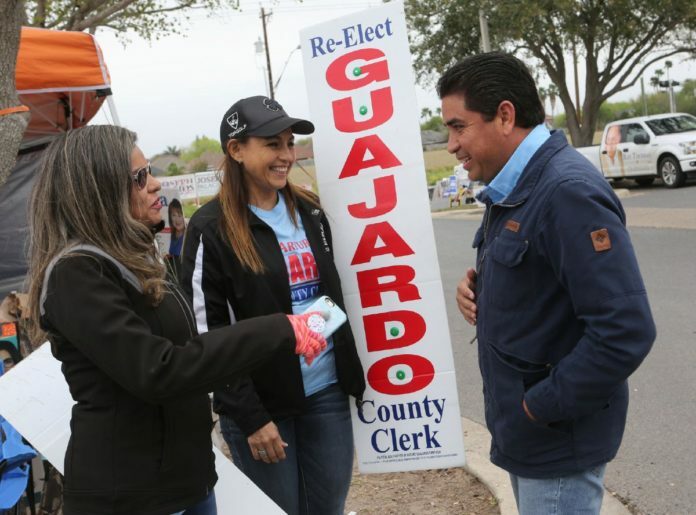 “I knew that he was going to clobber me just because of the amount of money that was pumped into his campaign,” Guerra said after the early voting results came in showing Rodriguez ahead by 80 percent. Guerra noted that he was mostly self-funded, whereas Rodriguez relied on large donations from Hidalgo County attorneys. “A lot of people are still being fooled by what’s going on in the DA’s office,” Guerra said. “When you have the national media against you, especially when they slant the Irene Garza case and don’t get a fair airing,” he added in reference to CBS’ “48 Hours” release of its segment on the Feit murder trial in early February. When asked what was next for him, Guerra said he would return to his daily business of trading and investing stocks. Rodriguez said he will continue building on everything he’s done over the past three years to ensure that the DA’s office is “efficient and effective with prosecuting our cases,” in addition to creating a public corruption division in the near future. “We have great relationships with law enforcement at the federal, state and local levels, but we feel that we have to have that division in our office, so we’re able to work on these cases ourselves,” Rodriguez said.